NEWPORT BEACH — More of the areas marked for dredging as part of Newport Harbor’s $10.5 million dredging project are reaching completion — and there has been reinstallation of mooring fields long out of service due to the much-needed dredging. The most recently completed areas marked for dredging include the Newport Harbor Yacht Club mooring field and the F mooring field areas. South Mooring Co., which installs and maintains the city’s moorings in the harbor, has been reinstalling the mooring balls back at their respective fields and contacting mooring permitees to let them know their vessels have been returned to the proper spots. With the Newport Harbor Mooring Realignment Plan recently approved by the National Oceanic and Atmospheric Administration, the mooring fields will be realigned with a slightly altered outer perimeter, which could result in some vessels being relocated from their previous locations. In addition, the channel along the back side of Linda Isle has also been completed, and residents in the area have moved their vessels back to the docks. Back in October, the last remnants of contaminated sediment marked “unsuitable for ocean disposal” were removed, with dredging contractor R.E. 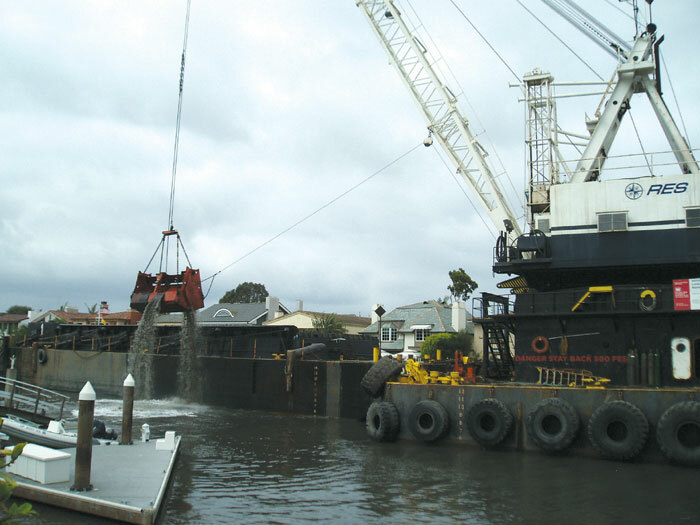 Staite barging the last portion of nearly 90,000 cubic yards of sediment to the Port of Long Beach’s disposal site. The project has rid the harbor of nearly 90 percent of its contaminated material, according to officials. The dredging activity has now shifted to the area along Lido Island’s Via Lido Nord. The remaining areas to be dredged include the federal channel near Balboa Island’s west end, the south side of Bay Island and along Bayshore Drive. During the Newport Beach Christmas Boat Parade, dredging activity will be shut down, and barges will not be traversing the harbor. Instead, the equipment will be moored the at the anchorage area between Lido Isle and Bay Island, as well as in the center of the channel between Harbor Island and Bayshores. Miller has reportedly been coordinating with the boat parade committee to make sure the dredging project does not impede the event.